Small in size, Goa packs a huge punch as a tourist destination. While most know Goa for being a party destination, there are a few tourists who love visiting for its calm surroundings, beautiful churches, historic temples, mosques and more. A famous tourist attraction in the north of Goa, the Fort Aguada was built in 1612. The fort stands on a hill lock that overlooks the mouth of the Mandovi River. One side the fort is flanked by the posh Taj Village hotel, while the other faces the sea. From the fort, you can catch stunning views of the sunset and the Mandovi River. A great place for fun and games, the Calangute beach is home to many experiences. At this beach, you can enjoy a plethora of water sports, party at the best shacks and enjoy a sun tan one of the beach beds. During the tourist season, the beach can get a bit crowded. The Vagator Beach has over the years gained immense popularity. The beach is famous for its parties and beach shacks. It is home to the 9 Bar one of the most happening party destinations in Goa and a few hotels. Apart from parties, another good reason to go here is to watch the sunset and enjoy stunning views of the beach from the cliff. The Chapora Fort actually became famous after the Hindi film Dil Chahta Hai was filmed here. The fort was built by the Portuguese in 1617 near the Chapora river. Made entirely from laterite rock, the fort now stands in ruins. However, there are some portions of the fort that still stand strong. Getting to the fort is simple, you can either go to the fort by bike or walk up to the fort. Located in Mapusa, the Bogdeshwara Temple was built in honour of Kanakeshwar Baba or Bogdeshwara. The temple is popular with business owners and the fisherfolks of Mapusa who believe that if one prays at this temple, their wishes are fulfilled. The temple feast is celebrated in the months of December or January, depending on the Hindu calendar. Located along the Portuguese influenced 18th June Road, the Kala Academy is a haven for Goan art and culture. To experience Goan culture, it is best to watch a tiatr (Goan play) at the Kala Academy. If you love art, drop by at the many galleries inside the academy and visit the travelling art exhibitions. There is a small café within the Kala Academy premises that serves snacks and tea. Located in North Goa, the Reis Magos Fort is a lovely structure. The best time to visit the fort is after 3 pm, to watch the sunset. There is a small museum shop near the foot of the fort. To enter, you will have to pay an entry fee for Rs. 50 per head. Situated nearby is the Reis Magos Church. A great place to experience shopping, the Anjuna flea market is held every Wednesday near the Anjuna Beach. At this flea market, one can shop for a wide variety of commodities. From clothes to bikes, spices, tattoos and more, you will find it all at this market. While you’re busy shopping, do not forget to enjoy delicious local snacks like chorizo pav and goan sweets. There are also live gigs held at the flea market. Located in the village of Pilerne, the Museum of Goa is a must-visit place for anyone looking to learn about Goa’s cultural heritage. The museum has exhibits and books that take you back in time to Goa’s rich cultural heritage. There is also an art gallery in the museum that displays excellent artwork and sculptures. The Arambol Beach in Goa is of the finest and unexplored beaches, this side of town. With amazing restaurants and a clean and quiet beach shore, the place is a great escape from crowds and the hustle of the other beaches in Goa. Located in North Goa, the Morjim beach is excellent for families and couples. At this beach you can enjoy boat rides, romantic walks and a few water sports. There are many resorts and beachfront restaurants, where you can enjoy good local Goan meals. The Miramar Beach in Goa is a great place to visit because of the sheer amount of things you can enjoy. There is the beach, where you can enjoy the sunrise, the promenade that’s a great place for a morning walk and shopping. Yes, along the promenade, there are various stores that sell everything from clothes to sweets and even handicraft items. Those looking for a bit of adventure can enjoy water sports, particularly boating and the jet ski at Miramar. If you are looking to do a bit of shopping, an ideal market to do that is in Mapusa. Open through the week in the morning and evening (the market is closed in the afternoon), you can shop for everything under the sun at the Mapusa Market. From alcohol to sweets, clothing and masalas, you can get whatever you are looking for at reasonable prices. There is a popular bar called the Pub that’s a great place to grab a beer or indulge in some seafood. While you are at the market, try you hand at the lucky draw. You’ll find plenty of stalls selling lucky draw tickets. A towering structure in the Old Goa Church complex, the Bom Jesu church is famous. It houses the mortal remains of St. Francis Xavier, the patron saint of Goa. The church has many beautiful altars and lovely artwork on the ceiling. On the first floor of the church, there is a small art gallery. For a historic insight into the church, you can hire a freelance guide from outside the church for Rs. 100. Situated behind a huge garden, the Se Catherdral has a tall, imposing structure. This church that measures over 76 metres long and 55 metres wide is one of the largest churches in Asia. The church was built in 1562 in true Tuscan architectural style. On one of the towers of the church, you can see the Sino de Ouro (Golden Bell) that is the largest church bell in Asia. Inside the church there are four altars and a water fountain believed to be used by St. Francis Xavier. Flanked by palm trees in the background, the Palolem beach is a must-visit place in South Goa. There is plenty do at the beach. You can choose to relax at a beach shack or enjoy water sports. The beach is also popular for its silent disco parties. Conceptualised by artist Victor Hugo Gomes, the Goa Chitra is a space dedicated to art and culture. It houses artefacts, objects, texts and a variety of objects from Goa’s rich past. Most of the objects on display are Mr. Victor Hugo Gomes’ personal collection. Entry fee for the museum costs Rs. 300 per head and it is open from Tuesday to Sunday. Modelled on the St. Peter’s Basilica in Rome, the Church & Convent of Saint Cajetan is a popular church in Goa. The church was built by Order of Theatines, a group of friars that were sent by Pope Urban to India. The main altar inside the church is dedicated St. Cajetan, the church’s patron saint. There is also an altar built in honour of Our Lady of Divine Providence. While visiting the church, do not forget to check out the beautiful paintings from the life of St. Cajetan. Located near the border of Karnataka and Goa, on the Mandovi River, the Dudhsagar falls are a must visit for any adventure or outdoor enthusiast. The best time to visit the scenic falls is just before the monsoon. An ideal way to spend time here is to trek up to the falls. The climb can be challenging, but the experience is a one to remember. 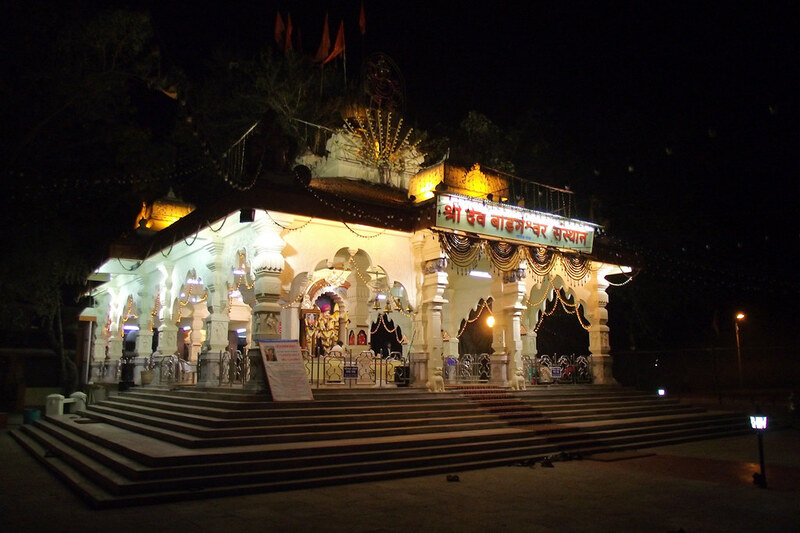 Located near Ponda, the Mangueshi temple is one of the most visited Hindu temples in the state of Goa. There is a tall deepastambha that is made using Christian and Muslim art influences. The Mangueshi temple houses an ancient Shivalinga that is believed to be more than 100 years old. A pretty beach in South Goa, Benaulim is a great beach to experience water sports in South Goa. From hopping onto a banana boat to enjoying a thrilling parasailing ride, you can have a lot of fun at this clean beach in South Goa. The Bondla Bird Sanctuary is one of the most popular sanctuaries in Goa. Home to a variety of animals including tigers and bison, a visit to this place offers a different experience. Hop onto to the safari for a clear and insightful experience into the world of animals. Stop over at the Den restaurant here, to enjoy delicious meals. 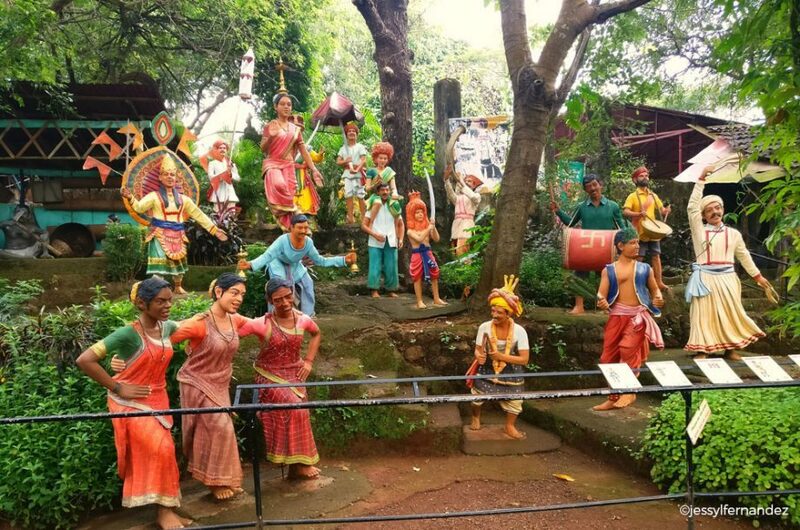 Ancestral Goa is a park that has displays depicting Goa’s culture and lifestyle. It was built to showcase and protect Goa’s rich and cultural heritage. The star attraction at the Ancestral Goa is the imprint of the Bigfoot that has a major legacy in Goa. Located near the Old Goa Church Complex, the St, Augustine Tower was formerly a church. It was destroyed after a plague and now all that remains are the belfry of the church and a few structures. Rich in history, go here to check out ancient Portuguese architecture. The Arvalam Waterfalls is best to visit in the monsoon. There are different viewing areas at the waterfall, and there is a pathway that leads you to the top. Those who are spiritually inclined can visit the Shiva temple that is located on the way to the top. Parking at the waterfall is free. Since the fort is located in a place that is not too popular, you will always find it empty. However, don’t lets its popularity fool you, there are exciting views to see from the top of the fort. Although it partly lies in ruin, the Cabo de Rama Fort is scenic and enjoyable. The Dr Salim Ali Bird Sanctuary is one of the only bird sanctuaries in Goa. It is where you can see different species of birds, including the white egret. At this place, you can also enjoy boating. For a fun experience, hire a tourist guide who will give you an insight and a historic background of the sanctuary. Goa is one of the few places in India, probably the only one where you can enjoy gambling. Held offshore, casinos in Goa are housed inside ships docked near Miramar. Open to anyone above the age of 18, at these casinos, you can try your luck at winning bumper prices or some extra money at the slot machines. There’s food and alcohol available too, in case you are looking to grab a bite or celebrate, after winning some moolah. It is no secret that one of the things Goa is famous for, apart from its nightlife, is water sports. At beaches across the state, you can enjoy activities like parasailing, jet skiing and banana boat rides. But, if you want to enjoy the best water sports in Goa, head to the Grand Island. at this place, you can go snorkeling or scuba diving to the deep ends of the sea and check out sights you would have probably never seen before. You can either take the long course that goes on for a month or do a short term course that is just for two days. Do not let this humble beach trick you into believing that there’s no action. Located close to the airport, about a 45 minute drive, the Bogmalo beach is a hub for under sea water sports. 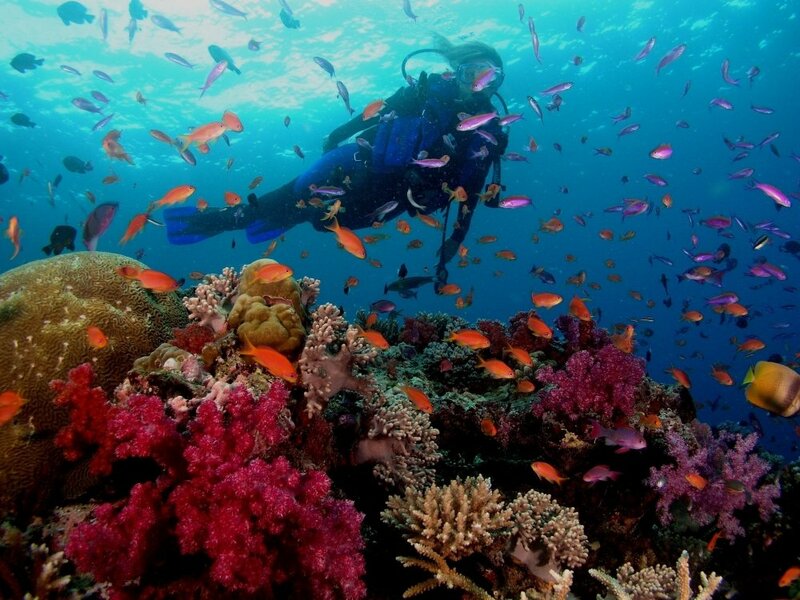 At this beach, many operators run snorkeling and scuba diving. You are taken to a certain point at sea and then dropped into the ocean. Great to experience, anyone who goes to Goa has to experience the water sports at Bogmalo Beach. Goa is not only famous for its nightlife and beaches, the state does have fabulous attractions that are worth visiting. So, the next time you are in Goa and are looking for a different experience, we suggest you visit these places and learn about Goa’s rich culture and heritage.